I will admit that when I first saw this concealer on the internet, I really wasn’t bothered about trying it out. Then I saw the incredibly beautiful Carli Bybel using these over on her YouTube channel and she tempted me into treating myself to these almost immediately. More or less as soon as I finished watching her video where I saw her using these, I hoped onto my Amazon account and within a couple of minutes I was checking out with a light shade to highlight with and a deep shade to contour with. Thanks to Amazon Prime, I received them the very next day! I will say that my first issue with these concealers came because I had no bloody idea how to use them. No matter what I did or how hard I tried, I could not for the life of my get the product to come out. I squeezed both of the tubes with all of my might and I still couldn’t get it to budge. In the end, I had to pass them over to my boyfriend who had to more or less stand on them to get the product flowing. Even though this was a bloody struggle to get it flowing to start with, once that initial product had come out, it was easy to use from there on. Just a pain in the arse to start with! Other than the product being a pain in the arse to get going with, I actually really like the packaging. I love that these are in a squeezy tube because it makes them great for travelling with. I also really like that there is an inbuilt brush with these concealers, because I don’t have to carry anything else with me to apply it with or have to pop some onto the back of my hand. I know that some people aren’t keen on the built-in brush because of cleanliness reasons, but as someone with clear skin who doesn’t have to worry about that, it really doesn’t concern me very much. First up, I want to talk about the two shades that I bought. I bought the shade Classic Ivory to highlight with and Beautiful Bronze as a contouring shade. The shade Classic Ivory when I looked at it online looked to be much more of a yellow highlighting shade, but when I got it through the post I realised that it is a much pinker based concealer. For an undereye highlight I do like to use yellow based products because they are much more highlighting and brightening. The contouring shade however in Beautiful Bronze I think is the perfect shade for contouring with. For the shade Classic Ivory, I like to use this around the face on the areas that I would usually highlight. This means underneath the eyes, centre of the chin, forehead and down the bridge of my nose. I think that the product applies really nicely straight from the brush applicator on the product. Once I have it on my face, I will go in and blend it into the skin using my damp Beauty Blender. I would say that once this is blended into the skin and my foundation it gives me a medium coverage because I can still see some of my darkness peaking through. I have built it up ever so slightly to make it full coverage, but it can start to feel quite heavy. In my opinion, it is the contouring shade in Beautiful Bronze that takes the crown in my opinion. Once I have concealed with the shade Classic Ivory, I will then go in and contour. I apply this to all of the usual places, forehead, under the cheekbones, jawline and lightly down the sides of the nose. Once this is on my face, I will take my MAC 130 Duo Fibre brush and blend that into the skin. I find that the contour blends into the skin much more evenly and flawlessly. Not only is the shade perfect for contouring with, it is a lovely and smooth product. For the price of these LA Girl Pro Concealers, I really do not think that you can go wrong with them. I think that they always blend in really nicely and look very good on the skin. I think I would like the highlighting shade more if I had a shade that is more suitable for my skin with a yellow undertone. I think that these were around £5 each which for a product of this quality, I think that it is incredible. As a drugstore product, I really think that these are pretty hard to beat when it comes to finding something to match them. 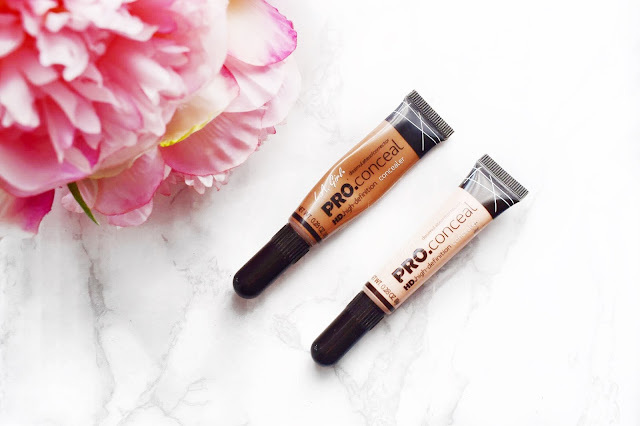 Let me know in the comments down below if you have tried out these LA Girl Pro Concealers and let me know what you think about them. I will also leave a link to them in case you want to check them out for yourself. I really do think that they are great products that I know I am going to continue reaching for.